July 1936 issue (from my collection). It is well-documented in books by and about Julius Shulman that he met architect Richard Neutra on March 5, 1936. On that fateful day they discussed Shulman's Kun House photos taken a week or so earlier on a site visit with his sister's tenant who happened to be a Neutra draftsman. Neutra was impressed enough by Shulman's photos to offer him work on some initial assignments and introduce him to other architects in his circle including R. M. Schindler and Raphael Soriano. What is not well-known is the actual date of the first publication of a Shulman architectural photograph after what Shulman describes as the official beginning of his career in architectural photography. 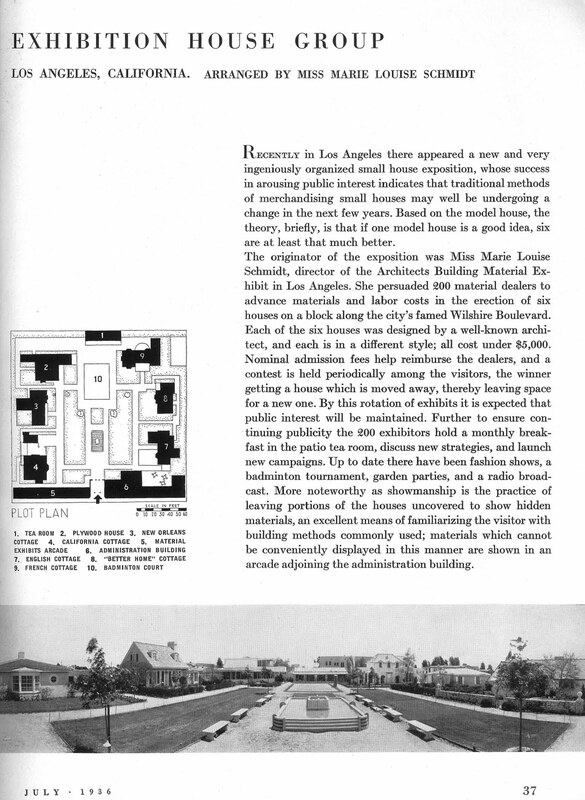 My exhaustive research on both Shulman and Neutra's careers leads me to believe that the July, 1936 issue of Architectural Forum (see above and below) is the publication having the honor with the article "Plywood House, Richard J. Neutra, Architect." Shulman understandably could not recall so inscribed my copy "Early Publication." (click on image below right to highlight). 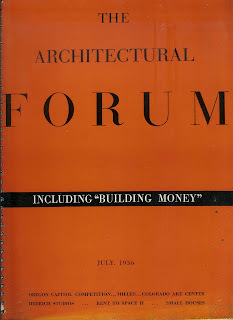 Architectural Forum, July, 1936. (from my collecction). Neutra designed his now famous Plywood Demonstration House for the above 1936 California House and Garden Exhibition at 5900 Wilshire Blvd. in the Miracle Mile district where now sits the Mutual Benefit Plaza complex designed by William L. Pereira & Associates. It was located directly across the street from where now resides the Los Angeles County Museum of Art. 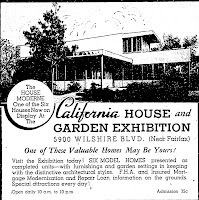 Described as the Moderne House in the voluminous ads and literature surrounding the exhibition (see typical ad below), it was on display with two houses by Paul Williams (French House and Steel House), and one each by John Byers and Edla Muir (New Orleans House) and Winchton Risley (California Cottage). Neutra, the consummate self-promoter and realizing the importance of this project to his career, hedged his bets and commissioned both Arthur Luckhaus and Shulman to photograph the house. Architectural Digest also hired Mott Studios to photograph for an 11-page spread in Architectural Digest. (See below). 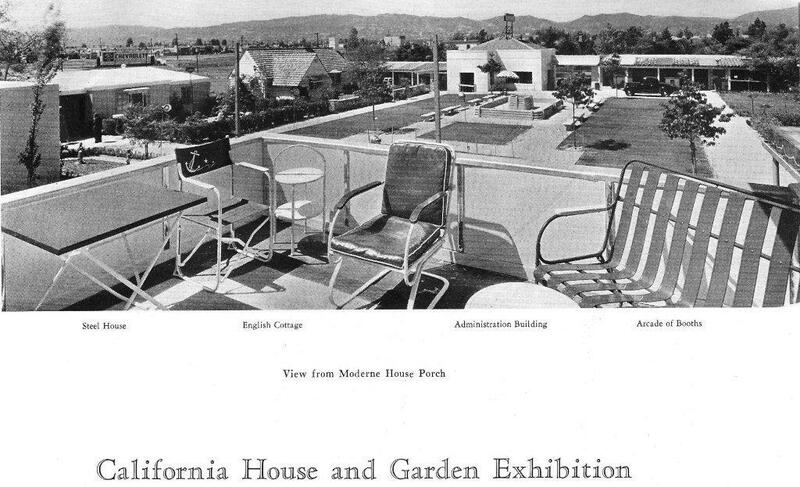 View of the California House & Garden Exhibition from the deck of Neutra's Plywood Demonstration House, Architectural Digest, ,Vol. IX, No. 3, 1936, p. 19). One of many 1936 ads marketing the exhibition with the Luckhaus exterior photo. The house was designed to be easily moved because all of the exhibition houses were raffled off at the end of the show. It's storied history began when John Entenza's father's law partner, Stella Gramer, was the lucky winner of the Neutra house. At the time she had just commissioned Harwell Hamilton Harris to design her a house, likely on Entenza's recommendation. She scuttled those plans and instead hired Harris to design the foundation and oversee movement and placement of the house on her lot located at 427 Beloit Avenue in Brentwood Glen where it still exists. (For much more on this see my California Arts & Architecture: A Steppingstone to Fame: Harwell Hamilton Harris and John Entenza: Two Case Studies). Plywood Demonstration House model by Stanton B. Coffin, 1939 for Museum of Modern Art exhibition "Art in Our Time." Richard Neutra Architect, 1936. 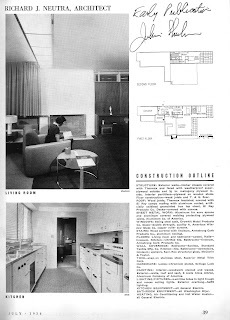 ("Modern-Style Home," Los Angeles Times, May 21, 1939, p. V-4). The house made a splash in the Big Apple in 1939 due to to the Museum of Modern Art's inclusion of a model (see above) in it's important "Art in Our Time" exhibition (see below) celebrating the Museum's 10-year anniversary and the move into it's new building at 11 W. 53rd Street. (Art in Our Time, Museum of Modern Art, 1939, p. 303). The house was later purchased in 1943 by noted modernist architect Maynard Lyndon where he lived until he moved into a house he designed for himself in Malibu in 1949. The house was next purchased by noted abstract artist William Brice, son of actress Fanny Brice and gangster Nicky Arnstein who brought Neutra back to design him a separate studio. (Seidenbaum, A., "How can you call a smooth slab 'Love in Italian'?" Los Angeles Times, May 28, 1967, p. I30). Marquee for Museum of Modern Art Exhibition, 1939. 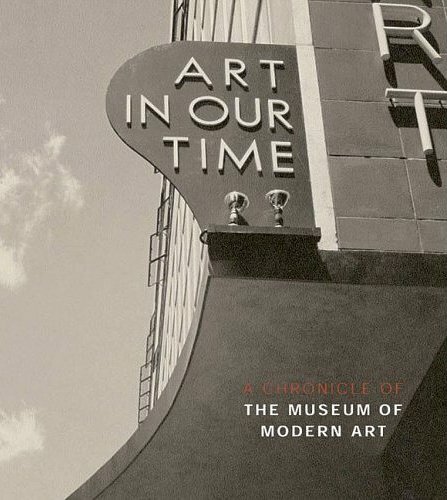 (Art in Our Time by Glenn Lowry, Museum of Modern Art, 2004). 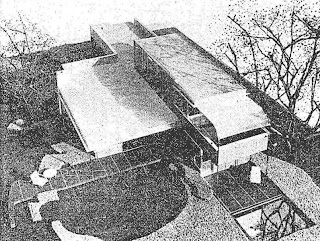 Neutra marketed the Plywood House with zeal globally. My 8,000 item Julius Shulman Bibliography lists the house no less than 26 times (see below) and my 5,000 item Richard Neutra Bibliography has 52 listings mainly because of the joint use of Shulman and Luckhaus to document the project. Like many of Neutra's projects, this single house has become a subject of study due to the amount of publicity generated by his promotional efforts. Another worthy field of study is Neutra's progression of principal photographers from Willard D. Morgan to Arthur Luckhaus to Julius Shulman and why he used both Luckhaus and Shulman on numerous projects from the late 1930s to the early 1940s. I would greatly appreciate any feedback if anyone can provide an earlier Shulman publication or any other comments on this post. (1936). "Exhibition House Group, Los Angeles, California, Plywood House, Richard J. Neutra, Architect." Architectural Forum 65(1, Jul): 38-39. (1936). "Plywood Model House, Los Angeles, California, Richard J. Neutra, Architect." American Architect and Architecture 149(Sep): 24-5. (1936). "Super-Plywood Model House, Los Angeles, Cal., Arch. Richard J. Neutra." Kokusai Kenchiku XII(10, Oct): 270-4. (1937). 42. "Plywood House, Richard J. Neutra, Architect. The 1938 Book of Small Houses. E. o. T. A. Forum. New York, Simon & Schuster: 60-1. (1937). "Details: Windows." House & Garden(Mar): 123. (1937). "A House of Plywood Designed by Richard Neutra." Building(Apr): 166-168. (1937). "Modernistic Type of Dwelling on Display." Los Angeles Times(Mar 7): E-1. (1937). "A plywood house." Architect & Building News 9(Jul). (1938). "Comparative Details 41: Modern Fireplaces." Pencil Points XIX(10, Oct): 665. (1939). Art in Our Time. New York, Museum of Modern Art. (1939). Art in Our Time: An Exhibition To Celebrate The Tenth Anniversary Of The Museum Of Modern Art And The Opening Of Its New Building Held During The New York World's Fair [exhibition catalog]. New York, Museum of Modern Art. (1939). "Show Architect's Work: Designs by Richard Neutra Are on Exhibition at Pedac [Exhibition]." New York Times(Jul 2): RE4. (1939). "Modern-Style House." Los Angeles Times(May 21): V-4. (1940). "Styled Doors in the Richard Neutra House [American Plywood Corp. ad]." California Arts & Architecture(Dec): 5. (1945). "Numero dedicado a la obra de Richard J. Neutra." 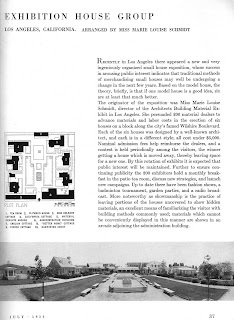 Revista de Arquitectura 30(299): 420-454. (1946). 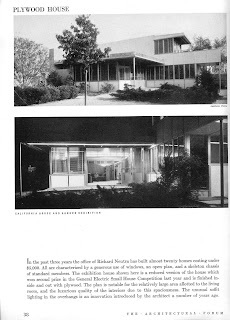 "Richard J. Neutra [Special Neutra Issue]." L'Architecture d'Aujourd'hui 16(6, Jun). Forum, E. o. T. A. (1937). The 1938 Book of Small Houses. New York, Simon & Schuster. Harrison, H. R. (1937). "Richard J. Neutra: A Center of Architectural Stimulation." Pencil Points XVIII(7, Jul): 407-438. Hines, T. S. (1984). "Neutra's all-plywood house: a design for an affordable home by one of the international style's most influential architects." Fine homebuilding(19, Feb-Mar): 28-33. Hines, T. S. (1989). Case Study Trouve: Sources and Precedents: Southern California, 1920-1942. Blueprints for Modern Living: History and Legacy of the Case Study Houses. E. A. T. Smith. Cambridge, MA, MIT Press: 82-105. Leatherbarrow, D. (2004). Topographical Stories: Studies in Landscape and Architecture, University of Pennsylvania Press. Lyndon, D. (2007). The Maynard Lyndon House Malibu. West Coast Residential: The Modern and the Contemporary. Vancouver, BlueImprint. McCoy, E. (1968). "Neutra." Los Angeles Times Home Magazine(Feb 11): Cover, A8, A14 (18 pages). Neutra, R. (1940). "Research on design of dwelling units with regard to regional differentiation." South African Architectural Record 25(2, Feb): Cover, 33-56. Neutra, R. (1959). "A Vista Beyond the Present Stage of Asbestos-Cement Application." International Asbestos-Cement Review(15): 4-7. Neutra, R. J. (1938). "How America builds 1937-38: influences on the trend of building design." Architectural Record 83(1, Jan): 60-63. Neutra, R. J. (1946). "Circunstancias que impiden el nuevo diseno constructivo." Revista de Arquitectura 31(Feb): 52-57.